When it is time to justify the invasion of a country that is of no threat to Allied forces, mass media deception kicks into high gear to sway public opinion. Only a few years after the “Watch-out-Saddam-is-gonna-nuke-us-all-with-weapons-of-mass-destruction” fabrication, mass media is now being flooded with horrible stories from Syria to incite people in Western countries to think “I hope we go in there and clean up this mess”. However, as it is often the case in war propaganda, lies, fabrications and deceit are used to justify military action. 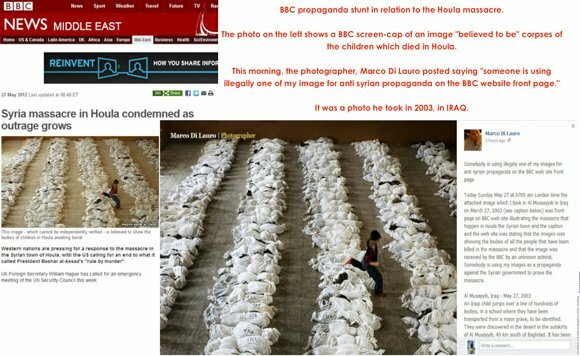 A recent example of this is the BBC using a horrifying picture from 2003 in Iraq to illustrate an alleged massacre that happened in Houla, Syria. When a “reputed” news source such as BBC gets caught using fake pictures to demonize a country, one can wonder what other fabricated BS appears in the news and goes unnoticed. Here’s an article on BBC’s “mistake”. Oops, BBC: Iraq photo to illustrate Houla massacre? With the shock of the Houla tragedy ringing across the world, the BBC has released a story with a harrowing picture of rows and rows of children’s bodies awaiting burial… But isn’t that post-Saddam Iraq? The picture was actually taken on March 27, 2003; it depicts an Iraqi boy jumping over dozens of white body bags containing skeletons found in a desert south of Baghdad. The image, which is published on Marco di Lauro’s website, is part of his story Iraq, the Aftermath of Saddam. Marco di Lauro takes photographs for Getty Images picture agency, his works have been published across Europe and the US. But the indication that the BBC picked his image from the internet, not from official stock worries him somewhat. “What I am really astonished by is that a news organization like the BBC doesn’t check the sources and it’s willing to publish any picture sent it by anyone: activist, citizen journalist or whatever. That’s all,” the photographer told The Daily Telegraph. “Someone is using someone else’s picture for propaganda on purpose,” he added. A BBC spokesman says the picture, illustrating Sunday night’s story “Syria Massacre in Houla Condemned as Outrage Grows,” was taken down “immediately” when the source was identified. “We were aware of this image being widely circulated on the internet in the early hours of this morning following the most recent atrocities in Syria. We used it with a clear disclaimer saying it could not be independently verified,” he added. These words about information “which cannot be independently verified” have become a trademark of media coverage of the 14-month conflict in Syria. Before UN special envoy Kofi Annan brought his peace plan to the troubled Arab country, the Syrian government had remained reluctant to open borders to most international journalists. But even now the bulk of information comes from people calling themselves opposition activists – via amateur videos uploaded to YouTube or eyewitness reports. But sometimes it looks that the mantra “cannot be independently verified” serves as a disclaimer to publish information which wouldn’t stand a chance of ever being verified.